Leslie Lauersdorf discusses her perceptions regarding daratumumab therapy and identifies how her patients have benefited from this treatment option. Risk stratification tools are frequently used to help guide treatment decisions after first relapse in multiple myeloma. Researchers have developed a new risk stratification tool consisting of 4 distinct dimensions that is used to characterize survival expectations. 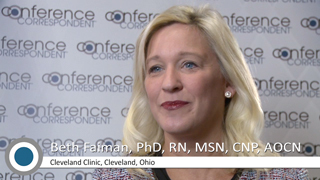 Leslie Lauersdorf discusses the need to balance optimism and realism in caring for patients with relapsed/refractory multiple myeloma. 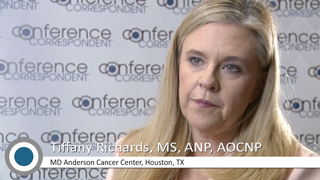 Tiffany Richards explains the difficulties she has encountered in managing patients who have battled myeloma for an extended period of time and have experienced multiple relapses. Tiffany Richards provides an overview of the most common questions she hears from patients regarding daratumumab. By prior treatment exposure, all subgroups in the CASTOR trial benefited from the addition of daratumumab to bortezomib/dexamethasone, including patients refractory to lenalidomide at last treatment. Tiffany Richards expresses her positive outlook on daratumumab, citing that the treatment has helped extend life expentancies. Leslie Lauersdorf addresses the different questions her patients ask her when they begin daratumumab therapy.